This is a fun and safe game, suitable for all ages. This game provides a nice alternative to sports that rely on strength, agility and speed. New players are always welcome. 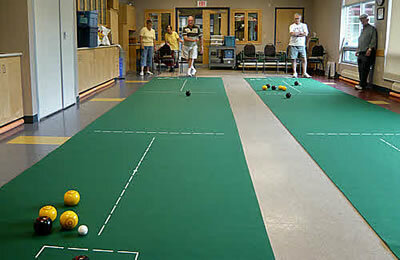 Carpet Bowling is a team game with two or three persons on each team. The object of the game is for each team member to gently roll special biased bowling balls down a 30 ft. long carpet so that they stop as close as possible to the small white ball called the jack. The team who get the closest to the jack scores points.